Whether you are joining us from away or right here at home we are so excited to welcome you to this year's festival! Please visit and carefully read our 2018 Festival Schedule and Box Office page for full details including rush line policies, Accessibility, and our Safer Space Policy. We've created a newsletter especially for our Delegates to help you easily navigate this year's Festival. We'll roll out email updates every morning, including details about the day's screenings, special events, and any unexpected changes. Sign up for the SJIWFF29 Delegate Newsletter. Below is some important info to help you make the most of your Festival experience. Bookmark this page for easy reference. Before you travel, check out our Getting Here page for tips and advice. If you are local or traveling on your own, please jump to the Registration section below. If we've arranged your travel, please review your updated TRAVEL MEMO. Are we picking you up? Head toward baggage claim where you will meet a fabulous volunteer driver wearing a yellow Festival shirt welcoming you! Got your bags and still don’t see the driver? During the day, please call or text Karen, our Volunteer Coordinator, at (709) 986-6197 and she will take care of you. Have you been advised to take a taxi? Head toward baggage claim and call Newfound Cabs at (709) 744-4444. They also have an app that you can download! Further details are noted on your Travel Memo, or has been emailed to you. This is for pre-approved guests only. I didn’t receive a travel memo! If you did not receive a travel memo, it’s because you are travelling on your own, which is great! You will be responsible for all of your own ground transport, including taxis to/from the airport. You may contact Nicole at guestservices@womensfilmfestival.com to see if one of our Volunteer Drivers will be at the airport when you are, in which case you’re welcome to jump in to get a ride to the Alt Hotel. Otherwise, we’ll see you at Registration. If you're staying at the Alt Hotel, use the hotel confirmation # on your Travel Memo. Remember, Newfoundland has its own time zone, so be sure to adjust your watch, and head to Registration! All local and visiting Delegates must register at Festival Headquarters at the LSPU Hall. Delegate bags, which include your Delegate Pass (needed for all events and to obtain tickets), will be waiting for you at this location. Festival HQ is also your source for program guides, WiFi, schedules, coffee, merchandise, and you can reserve your tickets here. *If you arrive late between October 17-20, you may also stop by to register between 5:00pm-9:00pm. Your Delegate Pass is NOT a film screening ticket. To obtain your screening ticket present your Pass at the appropriate Box Office. Tickets may be reserved in advance through the LSPU Hall Box Office by phone or in-person. Tickets must remain at the box office until the day of the screening. There will be absolutely no latecomers for all screenings. IMPORTANT: All Delegate Passholder tickets (and complimentary screening tickets) must be picked up at least a half hour before start time. All tickets remaining a half hour prior to showtime will be released to the rush line for the public to purchase. Delegate Passes are valid to claim rush line tickets for free, but passholders will not be given priority (first come, first served). Your Delegate Pass acts as a ticket to all regular [Interactive] Film Industry Forum events at NIFCO, subject to capacity. Present Pass at the door for entry. Delegate Passes also include Forum Lunch Panels at Rocket Bakery, but you must reserve them in advance! Lunch Panels MUST be reserved through the LSPU Hall Box Office by 12pm the day prior (subject to availability). Tickets will NOT be available at the door. Obtain tickets early as these panels sell out each year! Vegetarian option available if noted during booking. Tickets to Face 2 Face Pitch Session are by appointment only and cost $20 (cash) at the door. The deadline to apply is Wednesday, October 17th at 11:59pm(NDT). The EXXONMOBIL OPENING NIGHT GALA and the EMERA NL CLOSING NIGHT GALA are not included with your Delegate Pass. If you previously RSVP'd and are no longer able to attend, please contact us. Beyond the screenings and Festival events, we want you to have a safe, fun time and enjoy our city. Bars/pubs are open until 2am Sunday – Thursday and until 3am on Friday and Saturday. The legal drinking age is 19 and smoking is banned in all public buildings, including bars and restaurants. Marijuana will be legal in Newfoundland & Labrador as of October 17th. Full rules and regulations can be reviewed here. You may also read more about Accessibility and our Safer Space Policy. All Delegates are responsible for their own ground transportation during the Festival. All of our venues are close to one and within walking distance. Our Opening & Closing night events at Scotiabank Theatres (Avalon Mall) is 5km away from the Alt Hotel. There will be two mini vans offering complimentary rides (for out of province guests only) to Scotiabank Theatre as follows. Please wear your Delegate Pass to avail of this service. Please note that it will be first-come-first-served basis and seats are very limited. Our volunteer drivers will be traveling directly to the Avalon Mall. Please meet outside the front entrance of the Alt Hotel to avail of this service. Shuttles will be leaving promptly. Wednesday, October 17th, 5:30pm. Two vans. (Invite-only reception starts 6:00pm sharp outside Cinema 10. 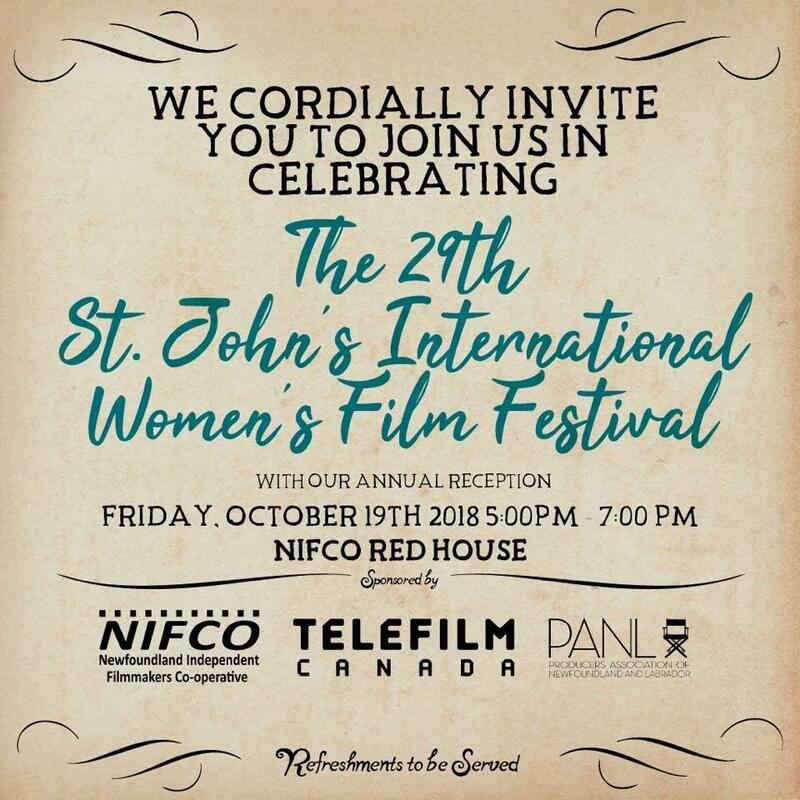 For Opening and Closing, Delegate/Sponsor Tickets are only available for pickup at the SJIWFF Box Office table outside Scotiabank Theatres (across from Fog City Bar entrance) on the day of the event starting 5:30pm on October 17 and 6pm on October 21. Any tickets not picked up by 6:45pm will be released to the public for sale. We want to hear about your Festival experience. Follow our social media* and share or tag photos with #SJIWFF29 #SJIWFForum. You may also share your experience by texting us at (709) 400-5579. Send an image with text and we'll upload it to our social media channels! *Links to our social media listed on footer of this page. We hope you had a great Festival week! Join our SJIWFF mailing list for submission deadline reminders, special event notifications, screenings, discounts and more. If we've arranged your travel, please review your updated TRAVEL MEMO. If you are staying at our Festival Hotel, please note that checkout is 11:00am. Safe travels and we hope you return next year!